What’s up Colts Nation? As the fantasy season begins to wind down, by default my time on this blog is limited. As I mentioned in last week’s blog, all I had to do to earn a spot in the playoffs is to win and I was in. Well long story short, I didn’t do that, instead I got blown out by one of the best teams in my league. The good news is that I have another league that I’m in where my team made the playoffs. The bad news is that team Colts Fan Casey is eliminated from playoff contention. My other team, “Make it Wayne on These Throws,” finished the season with a 10-4 record which is the inverse of team Colts Fan Casey’s record. So now let’s take a moment to look forward to this week’s games. Despite the HUGE playoff and postseason implications present in matchups across the NFL this weekend, there are a lot of favorable fantasy pairings as well. 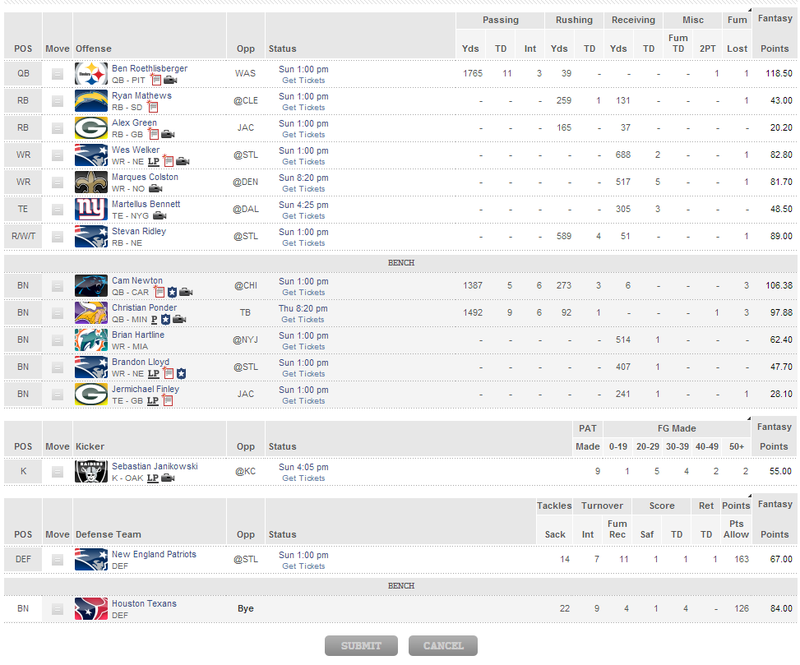 I’m going to show you guys a look at my other team’s roster for this week’s playoff game. It’s shown below. Week 15 Start em: He happens to be my starting QB, but I think Matt Stafford is your go-to guy this week as the Lions take on the Arizona Cardinals who are coming off a 58-0 loss at the hands of the Seahawks. Week 15 Sit em: I’m going with Bears running back Matt Forte. He’s had a good season on the fantasy circuit, but I found an astounding stat saying he hasn’t scored a touchdown in the last four games against the Packers. Sit Mr. Forte. Week 15 Random Thought: Don’t just base your starting lineup off of projections. Look at oppositions, trends, how teams handle the run vs. how they handle the pass. Look outside of the projections made by a bunch of pencil pushers. You know football now show it! What’s up Colts Nation!? I’m back for another week of fantasy football talk. Last week was not too good for me and my fantasy career. It has not been the best year to be on the “Colts Fan Casey” fantasy team. I feel like the powers that be are out to get me this season. I’ve never been this terrible in my entire fantasy football career. There’s really no explanation as to why whenever I play a team they have at least one play get crazy numbers. Well that happened again this week. This week’s culprit was AJ Green, who my opponent had who happened to score 29 points on 135 yards and two touchdowns. It’s not good news when your opposition’s flex guy goes for more points than both your starting backs and your flex player. As you may recall from last week’s blog, I partook in a pretty monumental trade in our league. As you can see below, it doesn’t help that I had two players fail to score any points. 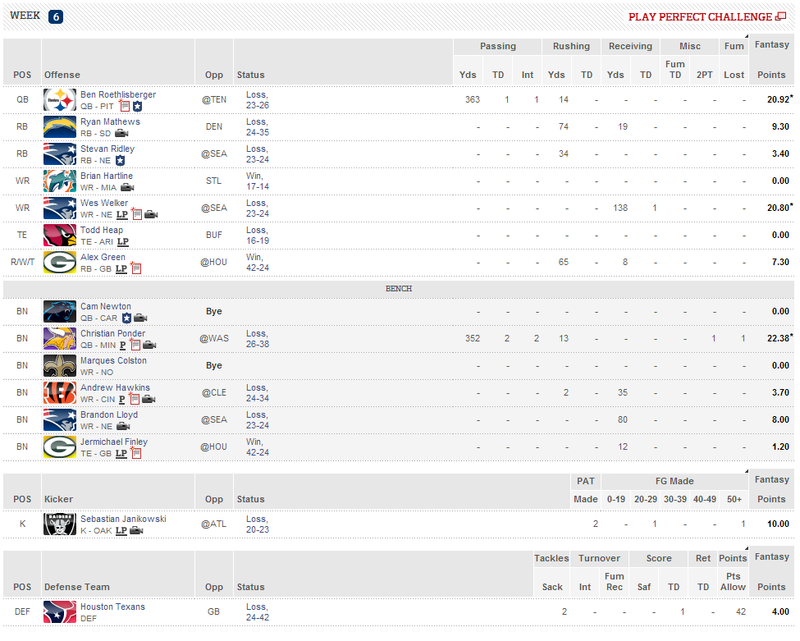 So this week I picked Felix Jones up off waivers and I am going to try to get my first win of the year. Feel free to leave a comment below if you think there’s something I’m missing that is making my team struggle. Week 7 Start em: I have to go with a guy I went with earlier in the season but I think once again CJ Spiller is poised to have a big week. With Fred Jackson’s status uncertain it looks like Spiller will be the main back facing a rather forgiving Titans rushing defense. Week 7 Sit em: I have this guy in another one of my leagues, a league I’m actually winning in, but I think that sitting Mathew Stafford this week against the Bears isn’t a bad choice. You always have to be careful with QBs, but if you have a sufficient backup, put them in the game coach! Week 7 Random Thought: Since we’re almost midway through the season so now is a time to turn your attention from big name guys on subpar teams and look for consistent players on solid teams. Now is a great time to explore trade options as people might be willing to move guys in hopes to change things up heading into the playoffs. Look for guys on the perennial championship caliber teams. That’s it for today. Don’t forget to visit my homepage and watch some of my tailgate videos.